'Snips' (Lynda Miller, R. 1995). Seedling #192. MDB, 4-5" (12-14 cm). Early bloom. Red violet, falls with deep ruby red spot; beards light blue, orange in throat. Seedling #987: (seedling #684, unknown, x 'Copper Chief') X 'Copper Chief' . Miller's Manor 1996. From AIS Bulletin #301 April 1996 Introducing SNIPS (Miller) MDB, 4.5-5", E. This pure pumila bloomed for 3 weeks last year in our cool spring. 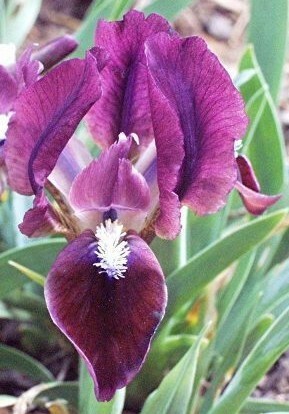 Deep red red-violet blossoms have deep ruby red spots highlighted by pale baby blue beards. Vigorous. 192: (684 X Copper Chief) X Copper Chief. 10.00. Miller's Manor Gardens.